Don’t tell us PeakNation™ over the Christmas holiday you missed this recent report from the Mercatus Center at George Mason University; no worries, that’s why you have us. “The most widely cited sign of progress toward a healthy economy has been the declining unemployment rate; however, the fall in the unemployment rate has largely been due to a shrinking labor-force participation rate rather than strong job growth. That’s at the national level, but things don’t look much better if we focus just on Colorado. In fact, compared to May of 2013 (the peak of jobs in Colorado last year), we have lost almost 20,000 jobs since then. Yet, at the same time Colorado’s unemployment rate dropped from 6.9% to 6.5%. No wonder China is beating us at math. 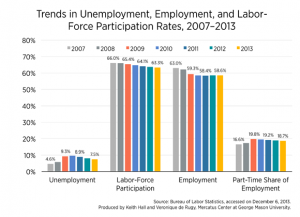 As the Mercatus Center pointed out, our drop can be almost completely accounted for by workers leaving the workforce. It doesn’t matter to the unemployment rate when you lose 20,000 jobs if over 30,000 people drop out of the labor participation force. The end result is the same. Then again, when you pass fake “job bills”, perhaps you just end up with fake jobs. Thanks Speaker Ferrandino! What a typical, lame, ad hominem attack, devoid of any critical argument. "Pay no attention to clearly demonstrated facts and a cogent argument! Koch funded the research so it must be bad!" I guess we should tell the many people benefiting from the Koch's donations to organizations such as the Integrative Institute for Cancer Research at MIT ($100,000,000), Johns Hopkins University for Cancer Research ($25,000,000), the Memorial Sloan-Kettering Cancer Center ($30,000,000), the M.D. Anderson Cancer Center ($25,000,000), the New York Presbyterian Hospital Weill Cornell Medical Center ($15,000,000), the Hospital for Special Surgery in New York ($25,000,000), and the Jaffe Food Allergy Institute ($10,000,000), to name just a few, that they should pay no attention to the results of the life-saving research being done there that could save their lives! The evil Koch’s funded it, so it can't be right! Doesn't surprise me. Sadly one cannot trust the government figures anymore. Inflation is another figure that has been manipulated for political ends. Since 1985, George Mason University (GMU), and its associated institutes and centers, has received more funding from the Koch Family Charitable Foundations than any other organization–a total of $29,604,354. The George Mason University Foundation has received the most funding, $20,297,143, while the Institute for Humane Studies has been directly given $3,111,457, the Mercatus Center $1,442,000, and George Mason University itself has received $4,753,754.